Sunbelt Rentals team members joined R.I.S.E. 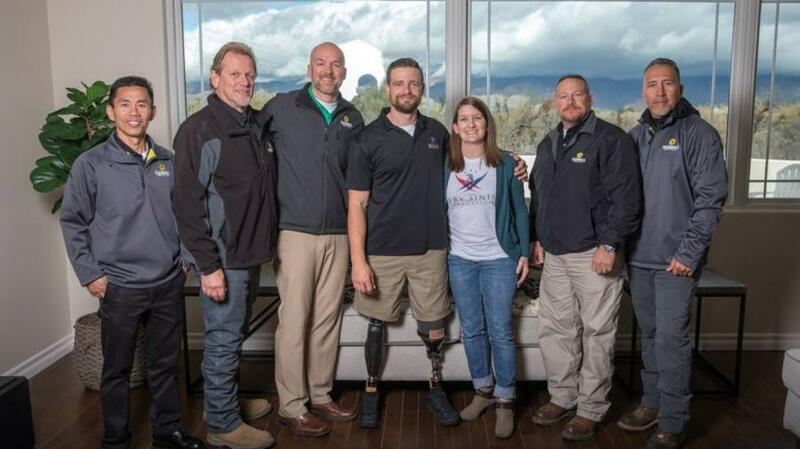 home recipient U.S. Army SFC Caleb Brewer and wife Ashley at their Feb. 6, 2019 GSF (Gary Sinese Foundation) home dedication in Tucson, Ariz.
Sunbelt Rentals has donated $1 million to the Gary Sinise Foundation's R.I.S.E. (Restoring Independence, Supporting Empowerment) program which provides 100 percent mortgage-free, specially adapted custom smart homes for America's severely wounded heroes. To garner support for the R.I.S.E program, Sunbelt Rentals began sponsoring a series of fundraising campaigns and community outreach efforts. The company was on hand at the 2019 Barrett Jackson auction this January in Phoenix, Ariz., where a custom jeep was auctioned off to raise $300,000 for the Foundation. Following the auction, the Sunbelt Rentals team presented Gary Sinise with a $1 million check — representing Sunbelt Rentals' collective efforts to support R.I.S.E. over the last year. "We are incredibly thankful to our friends at Sunbelt Rentals," said Judith Otter, COO at the Gary Sinise Foundation. "Their ongoing support, passion, and commitment to our R.I.S.E. program has helped change the lives for many of our severely wounded heroes and their families, giving them back the independence they deserve." "After achieving our goal to raise $1 million, our team was honored to present Gary and the R.I.S.E. program with these funds that allow the Foundation to help even more wounded veterans and first responders," said John Washburn, Sunbelt Rentals, senior vice president, Sales & Marketing. "This year, we will continue to increase our efforts and bring more awareness to the Foundation's work, to help positively impact the lives of those who have sacrificed so much for our freedom." Since January 2016, Sunbelt Rentals has supported the Gary Sinise Foundation and R.I.S.E. by providing tools and equipment needed for each of the program's home build projects — at no cost to contractors working on the R.I.S.E. program's home builds. Sunbelt Rentals also backs the program by donating a portion of rental proceeds from uniquely-branded Gary Sinise Foundation equipment to R.I.S.E. "From day one we've had an incredible relationship with the Gary Sinise Foundation, and we look forward to our continued partnership with this amazing organization that does so much to honor our nation's veterans and their families," said Washburn. For more information about SUnbelt rentals, visit www.sunbeltrentals.com. For more information about the Gary Sinise Foundation, visit www.garysinisefoundation.org.